A funeral mass is scheduled for 9 a.m. Monday, Oct. 16, at Our Lady of Grace Catholic Church for Tomasa N. Cabezuela of Artesia. Cabezuela, 91, passed away Thursday, Oct. 12, 2017, at San Pedro Nursing and Rehabilitation Center. Fr. Frances Lazer will officiate the services, with interment to follow at Woodbine Cemetery. Pallbearers will be her nephews. Visitation will be held from 2-6 p.m. today at Terpening & Son Mortuary. A rosary will be recited at 8:30 a.m. Monday at Our Lady of Grace. Tomasa was born March 7, 1926, in Barancos de Guadalupe, Chihuahua, Mexico, to Francisco and Macrina (Machuca) Navarrette. On Sept. 20, 1950, she married Jose Cabezuela in Ojinaga, Mexico, and the couple moved to Artesia in 1960 from Texas. Tomasa was a homemaker and member of Our Lady of Grace Catholic Church. She was also a member of Sagrado Corazon de Jesus and a Cursillista. She had a passion for church and praying for many people, including her family and her church family. Tomasa loved to spend time with all of her nieces and nephews, and enjoyed crocheting. 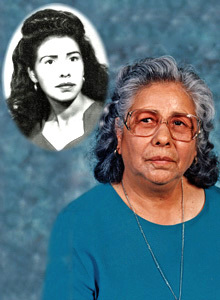 Survivors include her husband, Jose, of the family home; sisters Josefa Fuentez and Irene Corrales, both of Monahans, Texas; and numerous nieces and nephews. She was preceded in death by her parents, two brothers, and three sisters.